Children should be introduced early to continuous teeth brushing habits. However, there is still a large amount of toothpaste that is swallowed. Rinsing the mouth is still too difficult for younger children to manage. Putzi is intended for toothbrushing beginners right up until they start school. 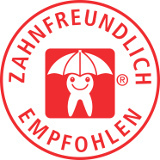 The toothpaste, developed with respect to the delicate infantile mucosa, contains a mild foaming agent and no ingredients, which might cause harm if swallowed. For this reason, it also only contains the recommended minimum amount of fluoride (500 ppm). Sweeteners (without sugar) and flavours have been chosen, in a way, the children can enjoy using the toothpaste without wanting or feeling the need to swallow. The Putzi toothpaste is available with „Tutti-Frutti + Calcium” and „Strawberry” taste. Both flavours have been developed by communicating with children and were tested in kindergarten. contains Sodium Fluoride (500 ppm F ¯).